Scott Deal is the President and Co-Founder of Maverick Boat Company. Not only does Maverick build one of the best technical poling skiffs on the market, but Scott has fished more days than many of us ever will. He is an accomplished angler and just a really great guy. I really enjoyed our conversation and learned a ton about skiffs and flats fishing. How did you get in the boat business? In 1982 I graduated from Princeton University and took a job with Xerox out of college. I had been fishing my whole life, but mostly freshwater. The Xerox job placed me in South Florida where I met some really great people who were involved in a much more technical aspect of fishing than I was used too. You had the Miami rod and reel club, and the Miami Herald used to put on the MET tournament. I would go out to the Key West wrecks and chum up fish and I thought that was really exotic. 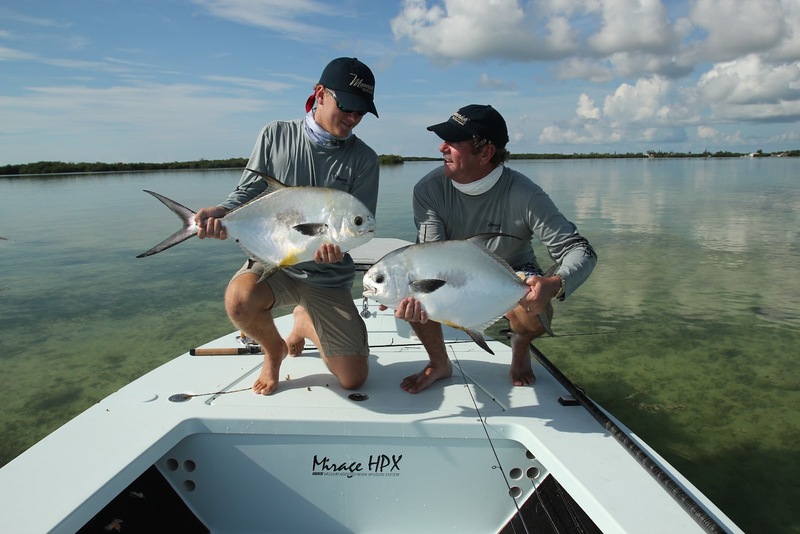 Scott Deal with his son, Clay, and a double permit hookup. I became good friends with Frank Gomez, who fished out of Flamingo. I had a small center console and I realized that this wasn’t really the right tool for the job. Frank fished out of an old Hewes Redfisher called the Sand Witch, and he introduced me to a guy named Herman Lucerne who lived out of a houseboat in Flamingo. I was 24, young, and had time so I spent a lot of time down there with Herman. He eventually sold me his 18 foot 1977 Maverick. In the course of time I was transferred to the Keys and lived in Islamorada. My territory was from Homestead to Key West. I had a key to Herman’s houseboat and my wife was in law school at the time at the University of Miami. I would shoot over to Flamingo and fish Lane Bay and Hell’s Bay that Herman was so famous for. I also fished Islamorada for bonefish and tarpon but would also do a lot of snapper fishing because I liked to eat them. When you’re young and living in the keys, you have a lot of friends who come to visit and everyone commented what a great boat the Maverick was. I ended up leaving my job with Xerox and was going to work in Orlando with my father. In the process, I took the old Maverick to Fort Pierce to be refurbished and I learned a lot about the business. I learned about restoration of the boats and I learned about the Maverick molds which were mothballed. I got together with my brother and we put our money together and for $12,500, we bought the tooling for the 18 Mavericks, restarted the subcontractors, and started the Maverick Boat Company in 1984. I knew the boats were great because I had spent so many hours on mine. Like many boat builders at the time, we were factory direct and custom because that’s the easiest way to get the business. I would drive around and do demos, take a deposit, and give it to the subcontractor. I soon found out that it was easier to sell them than to build them. So, I ended up building my own facility where I’m sitting right now and bringing production in house so I could control it better and I grew the company from there. We remained factory direct, but as flats boats became more popular, and I certainly was a flat’s boat Evangelist, but you’re limited by factory direct method. I approached Bob Hewes who had just sold his dealership to his son in law, and I had known Bob as a quality competitor. He came and visited us and we were a little more advanced because we were doing some advanced stuff like vacuum bagging and Kevlar. I ended up buying all the Hewes molds in 1989 and then we setup a dealer network. We redid the molds and boats, added some refinements, and Hewes took off and did well. We ended up setting up a quasi dealer network for Mavericks. You can still buy a Maverick from the factory, but ultimately you purchase it from the dealer. Then in 1997 we started Pathfinder and that’s our boat story. We went Pathfinder crazy and we’re building 1,000 per year. Tell me about your company. How many employees do you have and what are your facilities like? We operate out of one campus here and in four separate areas. The custom Maverick guys don’t work on Pathfinder’s or Cobias and vice versa. We have about 110 employees. What makes Maverick different from the other skiffs on the market? Truthfully it’s a product-by-product comparison. I will tell you that the HPX V series 17 and 18 run, ride, and perform in an all around basis like nothing else on the market. Very efficient, very easy on the pole, it tracks well, holds well. I can tell you that it’s not always easier to pole a lighter boat. They can blow around a lot. A true technical poling skiff is like a hunting dog. When you stop, it stops. It will stay put until you tell it what you want it to do. Other skiffs the fun begins when you tell it to stop. There is a poling lack of knowledge by the people who sell these and who by buys them. Tell me about the boat building process. How long does it take to build a Maverick skiff and how many do you produce a year? It takes about two weeks to build a boat from gel to trailer. We build 100 Mavericks per year. It’s a smaller market than it used to be. There are fewer flats boat makers than there used to be. The bay boats have nuked the larger flats boat markets. How have your skiffs evolved over the years? In 1988, I fished a tournament with Mark Krowka. We did well, but we were in a horse race with Steve Huff. He and his angler had won the tournament many, many times and they ended up edging us out by a fish. At the banquet, Steve said to me, “Imagine what you could do if you had a real boat.” I took to heart what he said and about boats and started a dialogue with him about boats and his boat, which he built himself. And we talked about hull slap and presence. Then I set about to build from scratch the first boat designed to be poled. To build a boat around no hull slap, ocean tarpon fishing and tailing bonefish. This was the Mirage series. I actually coined the phrase technical poling skiff to describe the boat instead of flats boat. When did the high end skiffs like maverick switch over to all composite type materials so that there is no wood, no rot? When I first started Mavericks, we used plywood clamped transom. Everything else was PVC. We didn’t’ have the density of foams back then. Within a year or two, in 1986-87, we switched and then there was no wood used. What are the biggest advancements at Maverick in the past five to ten years? It’s hard to say. We are continuing to evolve. The new 18 is phenomenal product because with a light load it will run fast with a 90 HP. I’ve got tournament guys with 150hps who will run in the 60 mph range. My goal for this boat was to build something that hasn’t been done before. To the untrained eye, the five different Mavericks look very similar. But I know that to a serious skinny water fisherman they are quite different. Can you tell me a little bit about the differences between the five different Mavericks that you sell? The 17 Micro. This is a boat for super shallow water where you have a need for a sub 6 inch draft. It can be purchased with a tiller or console. It’s for someone who doesn’t need to cover a lot of ground or run through big water and doesn’t need to go 50 mph. I would say this is a redfish boat. The 17 Tunnel. Take everything about the micro and add need to get up in 17 inches of water. In Texas, these guys don’t have an option. They have to be able to run and get up in super shallow water. It’s not quite as efficient as a clean V hull. This is a redfish boat. The 17 HPX. All around keys permit, tarpon, bonefish boat. 2-3 guys. Super nimble on the pole. It’s a tournament fly fishing boat. Can handle rough water, runs fast, it’s a real athlete on the pole. It makes no noise. The 18 HPX. This skiff is for someone who wants a bit more room and wants a functioning live well. And someone who wants to cruise at 50 mph. Can you explain how the tunnel hull works for me? What are its advantages and disadvantages? The term tunnel is used on two different types of boats. Race boats use them. Then there is a tunnel designed for shallow running. By it’s nature, it’s an inefficient design for running. You can actually build a boat where the hull, prop, and lower unit is above the water. But, it comes at a cost because it creates negative push on the boat. You can dial the tunnel up or down. You really need them in Texas to get on plane. We’ve been doing them for many years. For someone new to boating, what are the things I should be thinking about when buying a boat? It’s what I call the 90-10 rule. Which people routinely violate. It means get the boat that does best for what you do 90 percent of the time well. Look at what you’re going to do. Not what you see on TV, but how you fish, and what works best for you. I live on the water, so at least once a week. In the summer I like fishing on the beach for tarpon, sailfish on light tackle, sight fishing in the winter when the water is very clear for trout and redfish. What's your favorite fish to go out fishing for and how do you like to fish (fly, spin, etc)? I want to say I’m not a fly snob, but I’ve done a lot of fly-fishing, and it is hard to beat fly-fishing for tailing bonefish and fly-fishing for laid up tarpon. I'll be fly fishing next week in the the Bahamas.